Update: Google says the blockage is a technical glitch. 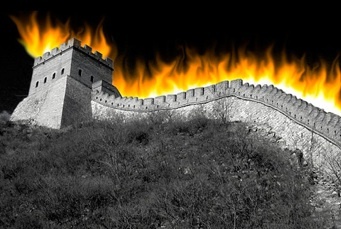 China’s firewall is mistaking it for Radio Free Asia. One blogger in China says all searches on Google return the “white screen of death” and result in a connection reset. Although some Tweets from inside China say they have no problems with Google being blocked. Google’s Mainland China availability page has yet to be updated today and showed no issues with Web search as of yesterday. However, Google’s mobile sites started to be partially blocked three days ago. Gmail is still working. Whether China is moving to completely block Google or it is just tweaking its settings on the Great Firewall, the Chinese government is likely to continue its efforts to clamp down on access to Google. Chinese media are not allowed to veer from the Party line when discussing the issue. But blocking Google entirely also serves as a stark reminder to China’s people that the Great Firewall exists and there is a whole other world of information on the Web their censors don’t want them to see.